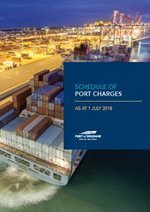 The use of Port of Brisbane Pty Ltd (PBPL) facilities attracts charges as defined in the pricing schedule (all prices are inclusive of GST). By using the facilities, you agree to be bound by the terms and conditions contained within this schedule and all other relevant PBPL documentation. For further information about Dangerous Goods and facility charges, please refer to the Port Notices and Port Charges. Pilotage at the Port of Brisbane is the responsibility of a privately-operated company, Brisbane Marine Pilots Pty Ltd.
Pilotage is compulsory for every ship that is 50m LOA or more, or any ship if directed by the Harbour Master. This does not apply to ships with masters holding a pilotage-exemption certificate. Requests for pilots should be made via the ship’s agent, giving at least 48 hours' notice. Brisbane Marine Pilots maintains a 24-hour listening watch on VHF channel 12. ETA at the boarding ground should be confirmed at least two hours before arrival by calling 'Brisbane Harbour' on VHF channel 12. This vessel traffic monitoring service is dedicated to the Great Barrier Reef and Torres Strait region 24-hours to prevent collisions or incidents. The area has high environmental significance and is protected by a range of national and international measures. Click here to see the ReefVTS in action, and hear from the staff who use it to monitor and protect the Great Barrier Reef. Under the Transport Operations (Marine Safety) Act 1994, control of navigation in the port is the responsibility of the Regional Harbour Master, an officer of Maritime Safety Queensland. Vessel Traffic Services, a division of Maritime Safety Queensland, is responsible for shipping movements in the pilotage area and operates 24 hours a day. If you require any information regarding ships, ports or other maritime matters, visit the Maritime Safety Queensland. Access to the port is via Moreton Bay where deep-water channels are a minimum 280m wide from Fairway Beacons (FWB) to Entrance Beacons, and the minimum depth is 15.0m LAT (Lowest Astronomical Tide). Pilotage is compulsory for ships over 50m Length Overall (LOA). All ships of 35m LOA and over must report their movements to Port Control. Minimum under keel clearances (UKC) for Moreton Bay vary according to the vessel's draft and the route taken. If a tanker's or bulk carrier's draft exceeds 12.5m or a container ship's draft exceeds 12.0m, then a tidal window will be calculated. The Brisbane River is dredged to 9.1m LAT upstream of the Fisherman Islands swing basin and a minimum UKC of 0.6m is required. This UKC increases with draft. Minimum UKC alongside any wharf is 0.3m. UKC windows for both the bay and river can be obtained from Brisbane Port Control.